Our product range includes a wide range of hang tags for clothing, cardboard hang tags, hang tags, creative hang tags, garment hang tags and jeans hang tags. 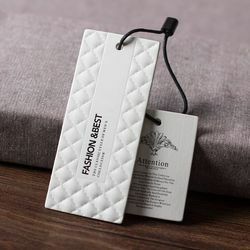 With the assistance of the most competent professionals and latest technology, we are able to manufacture, export and supply a high quality range of Hang Tags for Clothing. The offered hang tags are manufactured using high grade raw material and innovative technology in sync with industry norms. Our provided hang tags are praised for their excellent strength, durable print and smooth finish. 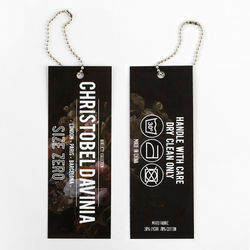 Keeping in mind customers’ demands, we offer these hand tags in different sizes and designs. Being the leading names in industry we are manufacturing, exporting and supplying an exclusive range of Cardboard Hang Tags. 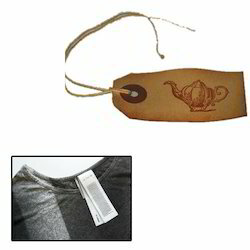 Offered Hang Tags are manufactured using best grade material and technology to meet diverse requirements of our clients. These are widely used to add the distinction of the products as well as provide the information about the product. Moreover, these are available in many colors and sizes as per choice of our customers. We are renowned as a leading name engaged in manufacturing, exporting and supplying an excellent range of Hang Tags. Our qualitative hang tags are manufactured using quality tested raw material and sophisticated technology in sync with industry norms. Furthermore, our quality examiners test these hang tags on different parameters. 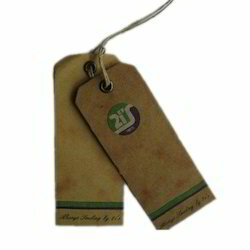 Illustrious for their fine finish, and attractive design, these hang tags are widely used in garment industry. With the assistance of skilled and experienced professionals, we are engaged in manufacturing, exporting and supplying a superior range of Creative Hang Tags. The offered hang tags are manufactured by skilled professionals using optimum quality raw material and cutting edge technology in line with industry norms. 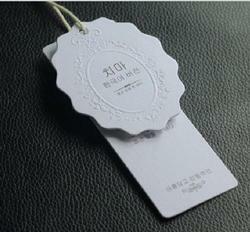 Furthermore, these hang tags are checked against different quality measures so as to ensure their quality. Our provided hang tags are widely praised in the market due to its various features. 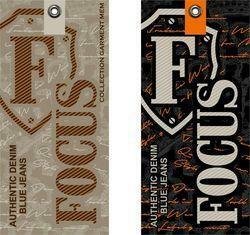 We are a remarkable entity engaged in manufacturing, exporting and supplying a wide assortment of Jeans Hang Tags. The offered hang tags are manufactured from supreme quality raw material and progressive technology in adherence with industry norms. 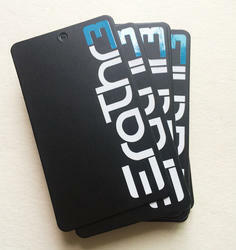 Our provided hang tags are known for their elegant designs and durable prints. In addition to this, these hang tags are availed from us at affordable rates. 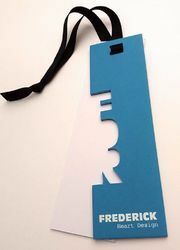 We are a reputed company engaged in manufacturing, exporting and supplying a premium range of Fancy Hang Tags. Offered Fancy Hang Tags are produced using high quality raw material which is procured from reliable vendors. These are available in market in various designs, sizes and colors. Fancy Hang Tags are mostly attached with kid’s garments, toys and are highly demanded in market due to their competitive prices. We have gained huge admiration of our customers by presenting optimal quality collection of Swing Tags and Hang Tags. The complete range of these tags is efficiently designed and manufactured by our vendors’ assiduous professionals using quality tested materials and sophisticated techniques. Our valued clients can avail the provided tags from us as per their exact needs and demands. Moreover, these tags are available at market leading prices. Looking for Hang Tags ?